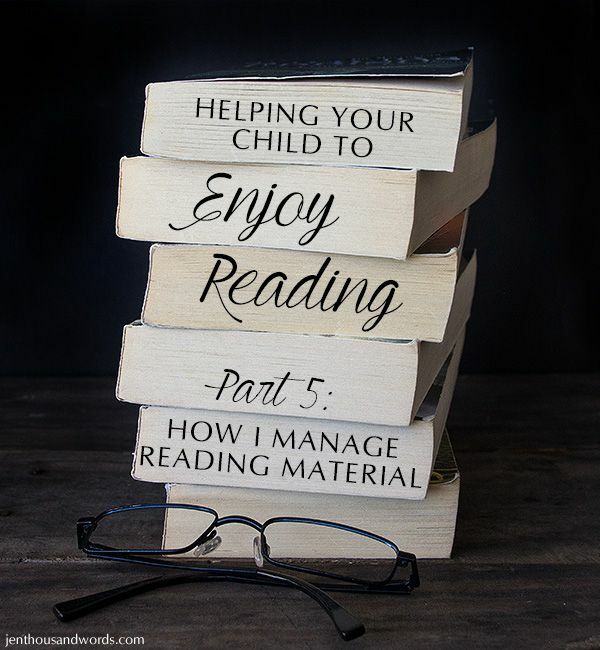 Today I wanted to talk about how I manage my family's reading material. I've taken that task on for all of us and I enjoy it and everyone in my family seems quite happy with the arrangement. I'll start with myself and Grant. I use a website and app called Tada List. It's no longer available, but there are similar websites and apps out there. Basically it allows me to create various lists online and I can check items off, or edit items, at will. I can also access the lists through an app on my phone. One of the lists I have is "Books to Read". If I loved a book and want to read more by the same author, I'll do a search for the other titles they've written and enter each one onto my list. 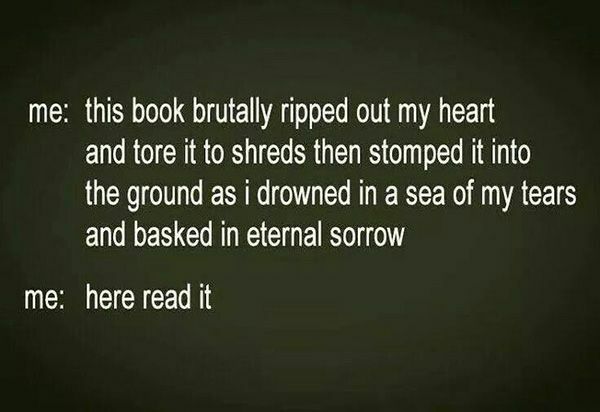 (I used to just put the author's name, but now I prefer to list each book.) If someone I know in real life or online, or a blogger I follow, or a YouTuber I watch, or basically anyone raves about a book then I put it on my list. It's now to the point where I don't even go to the library and browse for books - I currently have 109 books on my list that I want to read, and I'm working through those first. I use my library's website all the time. I log in with my library card number and then I can request any book I want. When it arrives at my local branch they email me, and I have 5 days to collect the book before it's placed back in circulation. The library is very near to me and I collect Daniel there after school every day, so it's no big deal to run in (or send one of the kids in) with my card and collect whichever books are waiting. There are even self-checkout facilities so it takes seconds. If - shock, horror! - I run out of reading material on a Saturday night and the library isn't open until Monday then I use the Overdrive app (the same one through which I borrow audiobooks) to borrow an e-book from the library. Phew, crisis averted! 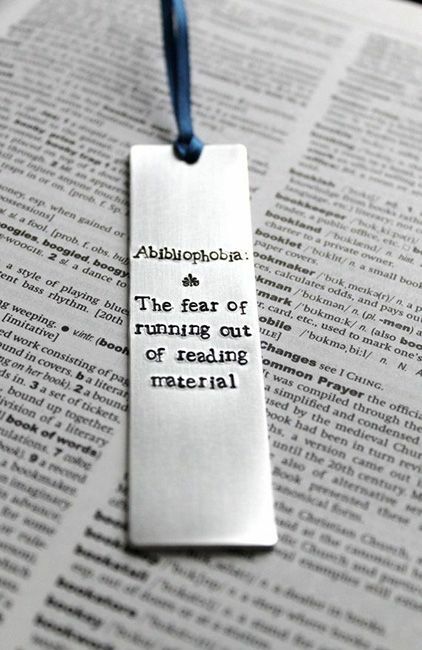 I never run out of books to read. I also download ebooks if I'm waiting for books that I've requested. I can search for books on my list and get them on my phone rather than just waiting for them in print. 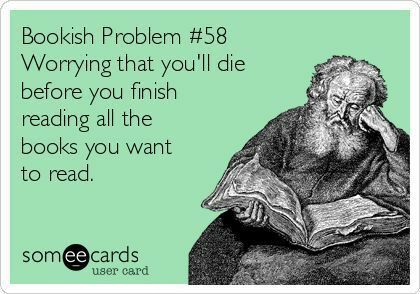 There are advantages to physical books and there are advantages to ebooks. I do like the convenience of having a book on my phone - it's great for those stuck-in-a-queue moments, or for the convenience of being able to borrow a book at any time, or for reading at night without having to put the light on. But nothing beats a paper-and-ink book that won't run out of battery power! I'm grateful to have both options. Grant's list is much shorter than my own. I know which books he'd enjoy out of the ones I read, and I only put those onto his list. He's currently enjoying the Outlander series and it's fun to be able to discuss the books (and now enjoy the TV series) together. He's a slower reader than I am, and has less time to read, so it's not a problem that his list is shorter. Daniel, on the other hand, warrants a spreadsheet of his own! He really, really doesn't like having to choose books. When I realised this, I quite happily took on the task. But where to start? How was I supposed to know what tween / teen boys like? I went down to the library and asked the young male librarian for some suggestions. He was very helpful, pointing me to books and series that he'd either enjoyed himself, or that he knew to be popular. Some of the series had the first book in stock so I could take them out right away; for the others I took photographs of the covers so I knew which series and author to look for online. 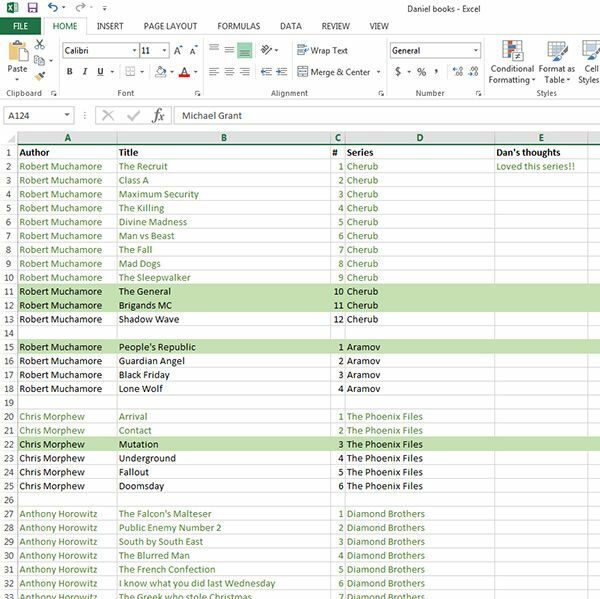 Then I came home and made a spreadsheet, listing the author, book title, number, series, and notes. As I request them from the library (which I do online, as mentioned above) I mark them with a green background, so I know which ones I'm waiting on. I mark the text either green or red (on a white background) once he has read the book - green if he's enjoyed it, and red if he hasn't, and try to add notes. As you can see, he generally doesn't give me much more feedback than, "It was boring." 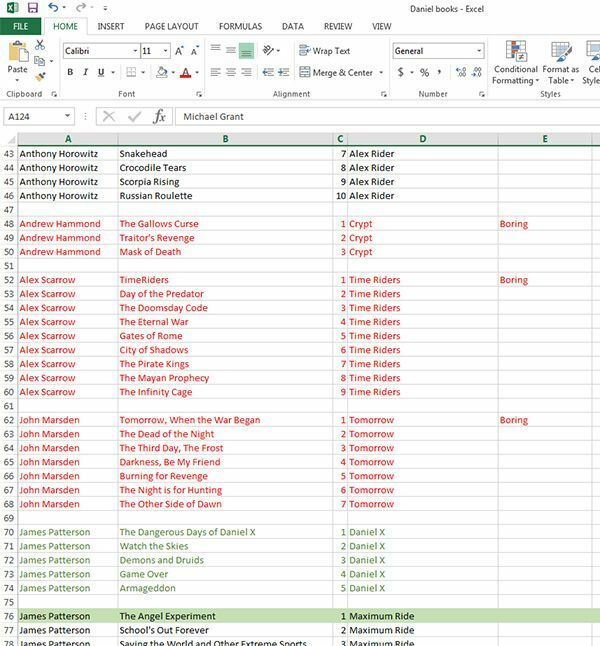 I keep the books on the spreadsheet so that I don't inadvertently request them in future, and also as books that Noah might enjoy when he's older, as he enjoys different books to Daniel and might like some that Daniel found boring. Daniel reads so fast that I almost can't keep up, so we now have a system - once he has finished a book, or a few books, he puts them on my desk. He lays them face up if he liked them and face down if he didn't. Then I know how to mark them off on his spreadsheet, and which ones to request (the next in the series of the ones he liked, or more by the same author). Noah doesn't have a spreadsheet, he just has a Tada list like Grant and I do. As he approaches the last third of his book I'll go ahead and request the next one in the series. Come back tomorrow for the last post in this series - I think it might be the most important.